The ravioli is best served immediately. If you’re making larger ravioli, be careful not to pile too many onto each other once cooked, or they will stick. Immediately add some olive oil once cooked to prevent sticking. • Make the dough. Add all of your ingredients into a food processor, process until you get a loose ball of dough. Do not overmix; it is ok if it is crumbly and loose crumbs of dough. On a floured surface, knead the dough for 8-10 minutes. This is a very important step, so do not skip. To knead, assemble all the bits of dough into a ball, and push forward against it using the heel of your palm. Turn the dough 90 degrees, and repeat. Do this until you obtain a smooth ball of dough, approximately 8-10 minutes. Cover the ball in saran wrap and let rest in the fridge for 30 minutes. • Make the fillings. In a food processer, blend all of the ingredients, except for the ricotta and the cheese and lemon zest (if making filling 2). For filling 1, you want to obtain a very smooth puree, and there is no risk of overmixing. However, for filling 2, you want to have distinct chunks of corn and basil, and so you want to be careful not to puree for too long. Stop pureeing when your corn is mostly pureed (but still a bit chunky) and you still have distinct pieces of basil. Transfer the contents of the food processor to a bowl, and mix in the ricotta, the grated cheese, and the lemon zest (if making filling 2). • Make the ravioli. For the ravioli, you will need to roll out your pasta dough to the thinnest setting. See below for troubleshooting while rolling your pasta below. I used a ravioli mold this time to make the ravioli, however you could also use a ravioli stamp or even thick jar lid. If using the mold, make two sheets of dough, and place one on top of the mold. Add a ½ tablespoon of filling to the mold, and seal with the second sheet of pasta dough. If using a stamp, lay a sheet of pasta dough on a flat surface, and add the filling. When adding the filling, make sure the filling is aligned on one side of the sheet, so that you can fold over the second side of the dough on top of the filling. Make sure the filling drops are placed apart from each other by at least the width (or diameter) of the stamp that you are using. Once you’ve made your ravioli, cover them in semolina and set aside in a single layer (do not pile them on top of each other). If cooking within a few hours, you can leave the ravioli out. However, if not using immediately, flash freeze in the freezer and then transfer to a ziplock bag (and eliminate as much of the air as possible). Frozen, the ravioli will keep extremely well! • Assembling the dish. Set a large pot of salted water to boil. Fresh (and frozen fresh) pasta cooks very quickly, so you will want to have everything almost ready before throwing the pasta into the water. In a skillet over medium/high heat, sauté shallots in some butter and oil. Salt them as soon as you put them in the skillet. Let them become translucent (approximately 5 minutes), and add the wine to the skillet and let simmer until evaporation. Everything from this point on will happen very quickly, so it is important to have everything ready. Once the water boils, add the corn and tomatoes to the skillet and the pasta (frozen or fresh) to the water. The pasta will only need 2-3 minutes to be cooked; you know it is ready when the ravioli have all risen to the surface. When ready, drain the ravioli and place in a flat~ish serving bowl where you can minimize piling them on top of each other (homemade ravioli are delicate!). Immediately drizzle some good quality olive oil over the pasta. Add a tablespoon of butter to the mixture in the skillet, and let melt. As soon as it has melted, scatter the contents over the pasta. 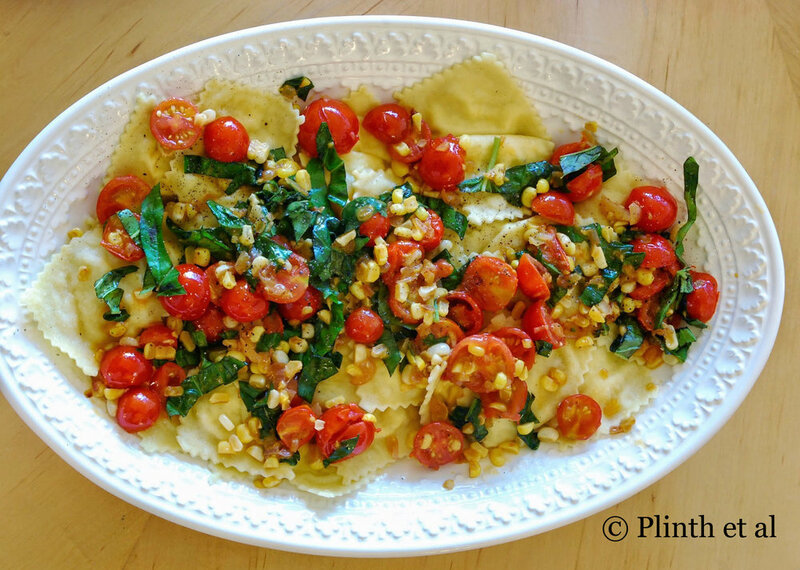 Grate a generous serving of parmesan over the tomatoes and ravioli, and add pepper and freshly torn basil.